Master Pipe maker Poul Winslow has unveiled two new pipe tobacco blends, to be exclusively distributed by Music City Marketing. Poul Winslow Blend #1 and #2 are both in the light to medium-aromatic flavor spectrum, and include tobaccos aged from three to five years. The tobaccos come in 100-gram tins at a suggested retail price of $13.50. Blend #1 is an aromatic mixture of Black Cavendish and Burley, contrasted with matured Virginia from three continents. Hand-blended and seasoned with exotic flavors, it is finished with Jamaican Rum. Blend #2 combines three-year-old and selected bright Virginia tobaccos with cured Black Cavendish. All the leaf types are individually cut and seasoned with Vanilla-Maple flavors and cream liqueur before being mixed by hand, and the blend is given a 40-day rest period to develop its unique flavor. Winslow has gained a reputation as a painter as well as a pipe maker, and his work has been featured in galleries across Europe. Each of the tobacco tins is topped with an example of Winslow's colorful paintings, giving the customer a chance to own a piece of art as well as a new pipe tobacco. Dunhill offers two new products in the popular Whitespot style just for pipe smokers. 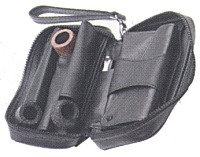 The Whitespot Three-Pipe case accommodates three pipes, a tobacco pouch. and accessories. It is crafted from black lambskin and comes with a detachable carrying strap. The Whitespot Five-Pipe case will hold five pipes and offers similar top-notch construction. The Three-Pipe case has a suggested retail of $190, and the Five-Pipe style has a suggested retail of $245. Both are made in Germany. Music City Marketing, Inc., Nashville, Tenn., Tel: (800) 251-3016. Kretek International, the exclusive importer of Denmark's Mac Baren pipe tobaccos, has introduced the Ultimate Beginners Pipe Smoking Kit, a coordinated effort between Kretek and Mac Baren to create new profit centers for tobacco shops, CTS stores, and chain operations. 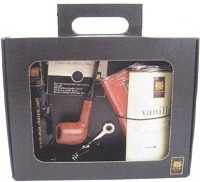 Packaged in an attach� with a clear window for product identification, the set includes all the basic needs for a new pipe smoker, including a quality imported pipe and two re-sealable 40-gram pouches of Mac Baren tobaccos in vanilla and cherry, which can be smoked individually or mixed together. The kit also contains pipe cleaners, a pipe tool, and a CD to help familiarize the customer with Mac Baren's products, and pipe smoking in general. Suggested retail for the entire kit is $36.95. Kretek International, Moorpark, Calif., Tel: (800) 358-8100, Web: www.kretek.com. Cornell and Diehl has launched Autumn Evening, a cased red Virginia cavendish with a light maple flavor - an entirely new approach to aromatics for C&D. It is sold in 4 oz., 8 oz., or 1 lb. vacuum packed, re-sealable bags, suggested retail $12.75 to $35. Solani White & Black (Blend 763) is the latest addition to the Solani All Natural tobacco line, available from Monjure International USA (336-889-2390). The blend is an English Ready-Rubbed Flake with dark Virginia, black Cavendish, and Syrian Latakia, packed in 50gm tins.